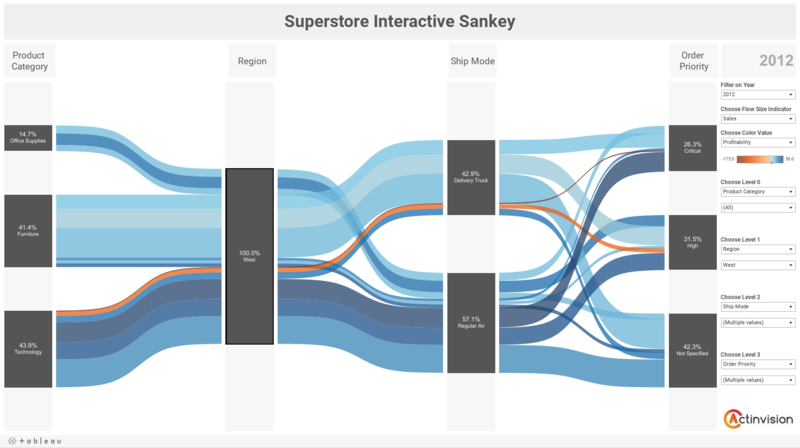 As I was working on building a Sankey Diagram with Tableau, I found the excellent articles of Jeffrey Shaffer from Data + Science developing a methodology to build a Sankey in Tableau. His two articles (first & second) were my starting points. This Viz is a dashboard made of 3 bar graphs to populate nodes and 2 sankey to show the flows. I will just explain how I built the first part of the Sankey and let you deduce the following one. - A MIN/MAX column: will Tag the curve whether it is the min line or the max line. Once it is done, just add the "Link" column in the dataset. I personally work on a Mac... connect to the excel file containing the two sheets (data and model). Just let Tableau automatically build the inner join... and go Tableau! I use the x in order to easily sort the flows alphabetically. Repeat the operation with Step 2 in order to build a new dimension called "Agg Step 2". These operations will enable us to choose the number of "nodes" to display in the bar charts and also to generate the positions of the flows in the Sankey. We then obtain the relative size of the flow compared to the total sum of the indicator (in percentage). This will enable us to build a stable display of the Viz. We will use this technique for almost all calculated fields. Here we want to define the starting points and the ending points of our Max Curves and our Min Curves. Let's start with Max Position 1. Using Table Calculation, we define it using this formula: RUNNING_SUM([Flow Size]) computed along Agg Step 1, Agg Step 2. Again this will be defined in the advanced option of the Table Calculation. The Min Position 1 will easily be defined as the Max Position 1 minus the Size of the curve i.e. : RUNNING_SUM([Flow Size])-[Flow Size] computed along Agg Step 1, Agg Step 2. Max Position 2 and Min Position 2 are defined using the same formulas. The only difference is that we will compute it along Agg Step 2 then Agg Step 1. The advanced options of the Table Calculation enable to define the order in which the curves will start and in which they will end. We will build a Max curve and a Min Curve based on Jeff's work. CASE ATTR([Min or Max]) // remember the data we added to the model ! When building the Viz, the "path" will allow us to join the points to show the polygons. Then place the "T" pill in columns and show it as a dimension (right click / dimension) and finally place the "Curve Polygon" in rows. On this one, we will not specify table calculations. Hide axis and repeat the operation for Step 2. Now you can build the Sankey in a Dashboard! It is fully interactive and responsive! Sorry that it is in French as well as the Tableau file and data... but this is my native language! Feel free to improve the method or email me for any question! Fantastic Olivier, this looks incredible! resources and this will be perfect for enabling me to do so! I just published another post regarding decision trees. The method could help to go further in such kind of viz ! Olivier CATHERIN your diagrams are beautiful! Thanks for sharing with us how to create them. I must admit though, that I have not been able to re-create them as I had hoped to. I tried to visualize a group senders sending payments to a group of receivers; pretty much an ideal use case for Sankey diagrams, I thought. Only even a bit simpler than your example. I suspect it is a matter of how both the senders (step 1) and the receivers (step 2) are grouped and ordered. Thank you SO much, Olivier CATHERIN! I brought a bit more of complexity to achieve this new viz based on superstore. Tell me what you think ! Thank you very much for the post! How do I get to highlight the entire path on hovering the mouse? Creating a highlight hover action produced this behavior. See my attached example. Hi Oliver, really good stuff! I've been working on applying this viz technique on quite a few datasources and to learn I've tried following both your steps and Jeff's. I am also having an issue with the sort it seems. After downloading Thorsten's original twbx above and removing the sort, I'm still unable to reproduce the Sankey viz as seen in your corrected repost. Did you take any additional steps to fix this? Any help or insight is greatly appreciated. Thanks, very helpful. Following it up, highlighting by "ID" (in the above example) is possible? That is, can the Step1-Step2-Step3 path for any ID be highlighted? I just have seen your post now. Do you still have issues with the viz ? I ran into the same problem when I worked on Thorsten's workbook. I reset all of the sort functions in the measures but the viz didn't look like the one in the corrected workbook. I finally realized that I had to reset the sort functions in the Curve Polygon pill. Click the drop down menu in the pill, select Edit Table Calculation, and update the sort order for the Calculated Fields until the viz displays properly. Re: Sankey Diagram with 3 different buckets?